This is a NEW aftermarket turbocharger, part # SBA135756151 for NEW HOLLAND skidloaders. 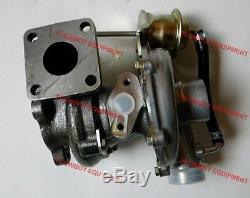 Replaces part #s 87771826, 87771827, SBA135756150, 135756151. PLEASE CHECK THE TAG RIVETED TO YOUR TURBO FOR 1 OF THESE PART #S. Only gasket included is the oil drain gasket. These turbos are made to meet or exceed all OEM specifications! This turbo will give you that extra horsepower & torque at an affordable price! PLEASE TAKE NOTE THIS TURBO MOUNTS WITH 4 BOLTS WHERE THE TURBO BOLTS TO THE MUFFLER ELBOW. PLEASE VERIFY THIS WITH YOU APPLICATION BEFORE ORDERING! PLEASE VERIFY THAT THIS IS THE CORRECT PART # FOR YOUR SKIDLOADER. CHECK OUT OUR STORE FOR MORE ENGINE PARTS. New Holland SKID STEER LOADER: LS170 Engine Serial # 108981 & Below - 4 Bolt Mount To The Muffler Elbow. CLOGGED AIR FILTER - REPLACE ELEMENT ACCORDING TO MANUFACTURERS RECOMMENDATIONS. OBSTRUCTED AIR INTAKE DUCT - REMOVE OBSTRUCTION OR REPLACE DAMAGED PARTS. OBSTRUCTED AIR OUTLET - COMPRESSOR TO INTAKE MANIFOLD - REMOVE OBSTRUCTION DAMAGED PARTS. AIR LEAK IN DUCT FROM AIR CLEANER TO COMPRESSOR - REPLACE SEALS OR TIGHTEN FASTNERS. AIR LEAK IN DUCT FROM COMPRESSOR TO INLET MANIFOLD - REPLACE SEALS OR TIGHTEN FASTNERS. AIR LEAK AT INTAKE MANIFOLD - REFER TO ENGINE MANUAL & REPLACE GASKETS OR TIGHTFASTNERS. OBSTRUCTION IN EXHAUST MANIFOLD - REFER TO ENGINE MANUAL & REMOVE OBSTRUCTION. OBSTRUCTION IN MUFFLER OR EXHAUST STACK - REMOVE OBSTRUCTION & REPLACE FAULTY PARTS. GAS LEAK IN TURBINE INLET TO EXHAUST MANIFOLD JOINT - CHECK MANUAL REPLACE. OBSTRUCTED OIL DRAIN / OIL INLET - REMOVE OBSTRUCTION OR REPLACE LINE. FUEL INJECTION PUMP/INJECTORS/CAMSHAFT TIMING INCORRECTLY ADJUSTED - CHECK MANUAL & ADJUST. WORN ENGINE PARTS - PISTON, RINGS, LINERS & VALVES - REFER TO ENGINE MANUAL & REPAIR ENGINE. PLOWBOY EQUIPMENT - PARTS FOR TRACTORS, COMBINES & HEADS, ROUND BALERS, HAY TOOLS & MORE! Check out my other items! The item "SBA135756151 TURBO for NEW HOLLAND Skid Steer Loader LS170 LX665 87771826" is in sale since Wednesday, October 25, 2017. This item is in the category "Business & Industrial\Heavy Equipment, Parts & Attachments\Heavy Equipment Parts & Accessories\Tractor Parts".